As the race to build a 3D printed house heats up on earth, so does it on the Moon. Russia has already announced plans to have a moonbase built by 2037, meanwhile European Space Agency and Foster + Partners proposed 3D printed buildings from lunar soil, and now Architecture Et Cetera (A-ETC) has released a proposal for a moonbase, called SinterHab, that would be 3D printed on the moon using lunar dust. SinterHab would be coated in melted lunar dust to protect it against the hazardous environment of micrometeorites and radiation. 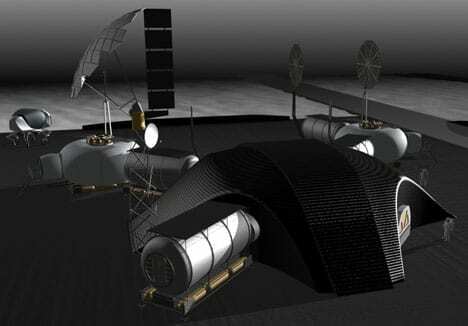 The proposal uses NASA’s concept of mobile 3D printing which repurposes the lunar soil, regolith, using microwaves. The moon dust can be heated by microwaves only as strong as those used in a conventional appliance. The microwaves bake the dust and turn it into a ceramic-like material and with the combination of microwave sintering and contour cutting, the dust can be used to construct any desired shape. The A-ETC moonbase is made up of bubble-shaped inflatable dome buildings that would be covered in this microwave-sintered soil and printed on the moon by NASA robots.